Suge Knight is notorious for intimidating nearly everyone in the music industry. Even now, the former head of Death Row Records sits in jail awaiting trial for murder and attempted murder after a hit-and-run incident in January 2015. 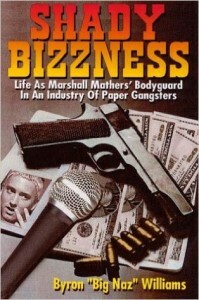 Not even Eminem was immune to Knight’s wrath as revealed by Eminem’s former bodyguard, Byron “Big Naz” Williams, in an interview with the Murder Master Music Show. According to Big Naz, it all went down at The Source Awards in 2001 when Eminem performed at the event. The bodyguard knew his job was going to be a tough one that night. He saw a scene starting to happen in the middle of the aisle where Slim Shady was sitting. Big Naz says that he confronted the goons and learned that Knight sent them to get into it with the Aftermath Entertainment signee and Detroit native. He remembers running around trying to take control of the situation with Dr. Dre. that directors Danny DeVito and Ron Howard have reached out to him. He details a meeting he had with producers in Hollywood and drew them in by comparing the film to the N.W.A biopic Straight Outta Compton, which set many box office records upon its release last year. Big Naz says he was part of the early process of Eminem’s classic film 8 Mile, but was blocked from further involvement by Slim’s team. He thinks he has a winning formula for an Eminem biopic because of the copyrighted material that is in Shady Bizzness that the rapper’s team cannot release without his permission. Share the post "Suge Knight Once Sent Goons For Eminem"